If there is one recent story that will surely remind organisations across the UK of the importance of having demolition surveys of doomed structures carried out prior to destruction work beginning, it has to be that concerning the Hounslow House site in the English capital’s London Road. The Health and Safety Executive (HSE) has reassured residents living near the building – which is being demolished for Tesco in readiness for the construction of 267 homes – that asbestos had already been removed from the site before work began. Fears had been raised with the collapse of an office block on the site in July, householders expressing concerns that the highly toxic substance could be present in the dust covering their balconies and windowsills. The office block’s partial collapse last year had resulted in rubble crashing into the nearby Hounslow bus garage, and prompted HSE to momentarily halt destruction at the site. A few weeks ago, work was allowed to resume, following the implementation of more stringent safety measures by the company responsible. The cause of the collapse is still under investigation by HSE. However, residents remain unconvinced by the new safety measures, with Aces Court resident Bernard Zieja claiming that the amount of dust made people reluctant to open their windows or use their balconies. An HSE spokeswoman said that dust complaints were a matter for Hounslow Council, which has previously warned the company carrying out the demolition work about undertaking noisy work outside permitted hours. 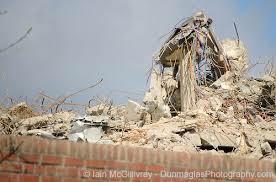 Contact Trident Surveying about professional demolition surveys. Formerly known as Type 3 surveys, these surveys are required before all or part of a building is demolished, and our company has extensive experience of carrying them out to the very highest standards.